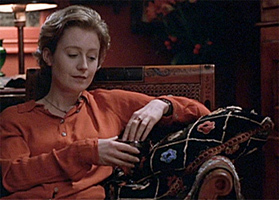 The pattern for this ensemble of pillow and bolster was inspired by Sliding Doors (1998 Paramount Studios). As the friends chatted onscreen, I saw only the pillow. Had to have one! Crochet yours while chatting with your best friend. Body: Tunisian Crochet; Border and embellishment: ordinary crochet. 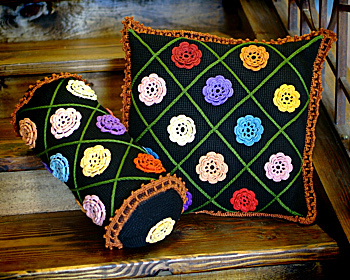 Kit includes pattern, wood Tunisian crochet hook, and sufficient Finca perle cotton (100% cotton, 2-ply) to complete one pillow top OR one bolster with accent grid and flowers of up to 17 different colors. Pillow form and fabric backing not included.